In 1995, actor Christopher Reeve fell off a horse and severely damaged his spinal cord, leaving him paralyzed from the neck down. From then until his death in 2004, the silver screen Superman became the most famous face of spinal cord injury. Most spinal cord injury causes permanent disability or loss of movement (paralysis) and sensation below the site of the injury. 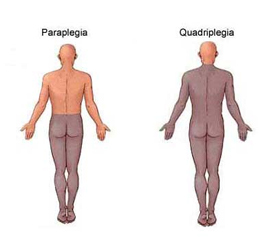 Paralysis that involves the majority of the body, including the arms and legs, is called quadriplegia or tetraplegia. When a spinal cord injury affects only the lower body, the condition is called paraplegia. Christopher Reeve's celebrity and advocacy raised national interest, awareness and research funding for spinal cord injury. Many scientists are optimistic that important advances will occur to make the repair of injured spinal cords a reachable goal. In the meantime, treatments and rehabilitation allow many people with spinal cord injury to lead productive, independent lives. The location of the injury : - In general, injuries that are higher in your spinal cord produce more paralysis. For example, a spinal cord injury at the neck level may cause paralysis in both arms and legs and make it impossible to breathe without a respirator, while a lower injury may affect only your legs and lower parts of your body. The severity of the injury : - Spinal cord injuries are classified as partial or complete, depending on how much of the cord width is damaged. In a partial spinal cord injury, which may also be called an incomplete injury, the spinal cord is able to convey some messages to or from your brain. So people with partial spinal cord injury retain some sensation and possibly some motor function below the affected area. A complete spinal cord injury is defined by total or near-total loss of motor function and sensation below the area of injury. However, even in a complete injury, the spinal cord is almost never completely cut in half. Doctors use the term "complete" to describe a large amount of damage to the spinal cord. It's a key distinction because many people with partial spinal cord injuries are able to experience significant recovery, while those with complete injuries are not. Paralysis of the lower half of the body is called paraplegia. Paralysis of both arms and legs is called quadriplegia. Together, your spinal cord and your brain make up your central nervous system, which controls most of the functions of your body. Your spinal cord runs approximately 15 to 17 inches from the base of your brain to your waist and is composed of long nerve fibers that carry messages to and from your brain. These nerve fibers feed into nerve roots that emerge between your vertebrae - the 33 bones that surround your spinal cord and make up your backbone. There, the nerve fibers organize into peripheral nerves that extend to the rest of your body. A traumatic spinal cord injury may stem from a sudden, traumatic blow to your spine that fractures, dislocates, crushes or compresses one or more of your vertebrae. It may also result from a gunshot or knife wound that penetrates and cuts your spinal cord. Additional damage usually occurs over days or weeks because of bleeding, swelling, inflammation and fluid accumulation in and around your spinal cord. Nontraumatic spinal cord injury may be caused by arthritis, cancer, blood vessel problems or bleeding, inflammation or infections, or disk degeneration of the spine. Whether the cause is traumatic or nontraumatic, the damage affects the nerve fibers passing through the injured area and may impair part or all of your corresponding muscles and nerves below the injury site. Spinal injuries occur most frequently in the neck (cervical) and lower back (thoracic and lumbar) areas. A thoracic or lumbar injury can affect leg, bowel and bladder control, and sexual function. A cervical injury may affect breathing as well as movements of your upper and lower limbs. The spinal cord ends at the lower border of the first vertebra in your lower back - known as a lumbar vertebra. So injuries below this vertebra actually don't involve the spinal cord. However, an injury to this part of your back or pelvis may damage nerve roots in the area and may cause some loss of function in the legs, as well as difficulty with bowel and bladder control and sexual function. Motor vehicle accidents : - Auto and motorcycle accidents are the leading cause of spinal cord injuries, accounting for almost 50 percent of new spinal cord injuries each year. Acts of violence : - About 15 percent of spinal cord injuries result from violent encounters, often involving gunshot and knife wounds. Falls : - Spinal cord injury after age 65 is most often caused by a fall. Overall, falls make up approximately 22 percent of spinal cord injuries. Sports and recreation injuries : - Athletic activities such as impact sports and diving in shallow water cause about 8 percent of spinal cord injuries. Diseases : - Cancer, infections, arthritis and inflammation of the spinal cord also cause spinal cord injuries each year. Men : - Spinal cord injury affects a disproportionate amount of men. In fact, women account for only about 20 percent of spinal cord injuries in the United States. Young adults and seniors : - People are most often injured between ages 16 and 30. But there is another peak in people older than 60. Motor vehicle crashes are the leading cause of spinal cord injury for young people, while falls cause most injuries in older adults. However, in some cities, acts of violence - such as gunshot wounds, stabbings and assaults - are a major cause of spinal cord injury. People who are active in sports : - Sports and recreational activities cause 8 percent of the 11,000 spinal cord injuries in the United States each year, although sports-related spinal cord injury is becoming less common. High-risk athletic activities include football, rugby, wrestling, gymnastics, diving, surfing, ice hockey and downhill skiing. People with predisposing conditions : - A relatively minor injury can cause spinal cord injury in people with conditions that affect their bones or joints, such as arthritis or osteoporosis. Paramedics and emergency workers are trained to treat people who have suffered a traumatic head or neck injury as if they have a spinal cord injury or an unstable spinal column, until a thorough screening and diagnosis can be completed. A key step in the initial treatment is immobilizing the spine. Immobilizing the spine can prevent injury to the spine or prevent worsening of any injury that is already present. For this reason, emergency personnel receive training in handling an injured person without moving the neck and back. They use rigid collars around the injured person's neck and place the injured person on a rigid board, until a complete evaluation can take place. In the emergency room, a doctor may be able to rule out spinal cord injury by carefully inspecting an injured person, testing for sensory function and movement, and asking some questions about the accident. But if the injured person complains of neck pain, isn't fully awake, or has obvious signs of weakness or neurological injury, emergency diagnostic tests may be needed. X-rays : - Medical personnel typically order these tests on all trauma victims suspected of having a spinal cord injury. X-rays can reveal vertebral problems, tumors, fractures or degenerative changes in your spine. Computerized tomography (CT) scan : - A CT scan may provide a better look at abnormalities seen on an X-ray. This scan uses computers to form a series of cross-sectional images that can define bone, disk and other problems. Magnetic resonance imaging (MRI): - MRI uses a strong magnetic force and radio waves to produce computer-generated images. This test is extremely helpful for looking at the spinal cord and identifying herniated disks, blood clots or other masses that may be compressing the spinal cord. But MRI can't be used on people with pacemakers or on trauma victims who need certain life-support machines or cervical traction devices. Myelography : - Myelography allows your doctor to visualize your spinal nerves more clearly. After a special dye is injected into your spinal canal, X-rays or CT scans of your vertebrae can suggest a herniated disk or other lesions. This test is used when MRI isn't possible or when it may yield important additional information that isn't provided by other tests. If your doctor suspects a spinal cord injury, he or she may prescribe traction to immobilize your spine, as well as high doses of the corticosteroid drug methylprednisolone (Medrol). There is some controversy about the use of this medication due to the small benefits noted in research studies and the possible risks. However, there are no other medications available at this time. So, methylprednisolone is often given as soon as possible, and it must be given within eight hours of injury. Diagnosis doesn't stop there, though. A few days after injury, your doctor will conduct a neurological exam to determine the severity of the injury and to predict the likely extent of recovery. This may involve more X-rays, MRIs or more advanced imaging techniques. Fifty years ago, a spinal cord injury was usually fatal. At that time, most injuries were severe, complete injuries and little treatment was available. Today, there's still no way to reverse damage to the spinal cord. But modern injuries are usually less severe, partial spinal cord injuries. And advances in recent years have improved the recovery of people with a spinal cord injury and significantly reduced the amount of time survivors must spend in the hospital. Researchers are working on new treatments, including innovative treatments, prostheses and medications that may promote nerve cell regeneration or improve the function of the nerves that remain after a spinal cord injury. In the meantime, spinal cord injury treatment focuses on preventing further injury and enabling people with a spinal cord injury to return to an active and productive life within the limits of their disability. This requires urgent emergency attention and ongoing care. Urgent medical attention is critical to minimizing the long-term effects of any head or neck trauma. So treatment for a spinal cord injury often begins at the scene of the accident. Emergency personnel typically immobilize the spine as gently and quickly as possible using a rigid neck collar and a rigid carrying board, which they'll use to transport you to the hospital. In the emergency room, doctors focus on maintaining your blood pressure, breathing and neck stabilization and avoiding possible complications, such as stool or urine retention, respiratory or cardiovascular difficulty, and formation of deep vein blood clots in the extremities. You may be sedated so that you don't move and sustain more damage while undergoing diagnostic tests for spinal cord injury. If you do have a spinal cord injury, you'll usually be admitted to the intensive care unit for treatment. You may even be transferred to a regional spine injury center that has a team of neurosurgeons, orthopedic surgeons, spinal cord medicine specialists, psychologists, nurses, therapists and social workers with expertise in spinal cord injury. Medications : - Methylprednisolone (Medrol) is a treatment option for acute spinal cord injury. This corticosteroid seems to cause some recovery in people with a spinal cord injury if given within eight hours of injury. Methylprednisolone works by reducing damage to nerve cells and decreasing inflammation near the site of injury. Immobilization : - You may need traction to stabilize your spine and bring the spine into proper alignment during healing. Sometimes, traction is accomplished by placing metal braces, attached to weights or a body harness, into your skull to hold it in place. In some cases, a rigid neck collar also may work. Surgery : - Often, emergency surgery is necessary to remove fragments of bones, foreign objects, herniated disks or fractured vertebrae that appear to be compressing the spine. Surgery may also be needed to stabilize the spine to prevent future pain or deformity. Controversy exists regarding the best time to perform surgery. Some surgeons believe it should be performed as soon as possible in most circumstances, while others believe it's safer to wait for several days before attempting any surgery. Research has not clearly proved which approach is better. After the initial injury or disease stabilizes, doctors turn their attention to problems that may arise from immobilization, such as deconditioning, muscle contractures, bedsores, urinary infection and blood clots. Early care will likely include range-of-motion exercises for paralyzed limbs, help with your bladder and bowel functions, applications of skin lotion, and use of soft bed coverings or flotation mattresses, as well as frequently changing your position. Hospitalization can last from several days to several weeks, depending on the cause and extent of the paralysis and the progress of your therapy. But treatment doesn't stop when you check out of the hospital. Here are some of the ongoing treatments you can expect. Rehabilitation : - During your hospital stay, a rehabilitation team will work with you to improve your remaining muscle strength and to give you the greatest possible mobility and independence. Your team may include a physical therapist, occupational therapist, rehabilitation nurse, rehabilitation psychologist, social worker, dietitian recreation therapist and a doctor who specializes in physical medicine (physiatrist) or spinal cord injury. During the initial stages of rehabilitation, therapists usually emphasize regaining leg and arm strength, redeveloping fine-motor skills and learning adaptive techniques to accomplish day-to-day tasks. A program typically includes exercise, as well as training on the medical devices you'll need to assist you, such as a wheelchair or equipment that can make it easier to fasten buttons or dial a telephone. Therapy often begins in the hospital and continues in a rehabilitation facility. As therapy continues, you and your family members will receive counseling and assistance on a wide range of topics, from dealing with urinary tract infections and skin care to modifying your home and car to accommodate your disability. Therapists will encourage you to resume your favorite hobbies, participate in athletic activities and return to the workplace, if possible. They'll even help determine what type of assistive equipment you'll need for these vocational and recreational activities and teach you how to use it. Medications : - You may benefit from medications that manage the signs, symptoms and complications of spinal cord injury. These include medications to control pain and muscle spasticity, as well as medications that can improve bladder control, bowel control and sexual functioning. You may also need short-term medications from time to time, such as antibiotics for urinary tract infections. Modern wheelchairs : - Improved, lighter weight wheelchairs are making people with spinal cord injury more mobile and more comfortable. Some wheelchairs can even climb stairs, travel over rough terrain and elevate a seated passenger to eye level to reach high places without help. Computer devices : - Computer-driven tools and gadgets can help with daily routines. You can use voice-activated computer technologies to answer and dial a phone, or to use a computer and pay bills. Computer-controlled technologies can also help with bathing, dressing, grooming, cleaning and reading. Electrical stimulation devices and neural prostheses : - These sophisticated devices use electrical stimulation to produce actions. Some are implanted under the skin and connect with the nervous system to supplement or replace lost motor and sensory functions. Others are outside the body. They are often called functional electrical stimulation (FES) systems, and they use electrical stimulators to control arm and leg muscles to allow people with a spinal cord injury to stand, walk, reach and grip. These systems are composed of computer-controlled electrodes that are taped to the skin or implanted under the skin and controlled by the user. One of the systems allows someone with a spinal cord injury to trigger hand and arm movements. These devices require more research, but they've gained a great deal of attention, in part because the actor Christopher Reeve was able to rely primarily on an FES bicycle that used computer-controlled electrodes to stimulate his legs to cycle. He also had a system implanted to stimulate his breathing. It's often impossible for your doctor to make a precise prognosis right away. Recovery, if it occurs, typically starts between a week and six months after injury. Impairment remaining after 12 to 24 months is likely to be permanent. However, some people experience small improvements for up to two years or longer. At one point, Christopher Reeve made national headlines when he regained the ability to move his fingers and wrists and feel sensations more than five years after he was paralyzed in a horse accident. But many not-so-famous folks with a spinal cord injury have made similar strides away from the media spotlight. And doctors are researching ways to improve late recovery. Stem cells are the master cells of the human body. They can divide to produce copies of themselves and many other types of cell. They are found in various parts of the human body at every stage of development from embryo to adult. This procedure is considered experimental as it is being tested in clinical research studies, and is not yet available as a standard medical treatment. The stem cells used in our experimental therapy are Mesenchymal stem cells, which are derived from your own bone marrow. These are multipotent stem cells that can transform into a variety of cell types, and thereby help in regeneration and repair of the diseased tissues. Spinal cord injury is one of the major neurological disabilities often encountered in clinical scenario. Unfortunately most traumas to spinal cord are irreversible and cause permanent disability having no option for further recovery. The Spinal cord injury patients will receive adult mesenchymal Stem Cell therapy, along with standard of care and Neuro-rehabilitation. Our hypothesis is that the injected mesenchymal stem cells having neuro regeneration potential migrate to the site of injury and replace the damaged nervous tissue with healthy functional cells, improving neurological function and quality of life.